Most restaurants nowadays think that its hard to manage and handle all the reviews that are published on websites. Numerous establishments also think that its hard to motivate people to leave reviews, risking losing business to competitors who have better or more reviews online. Moreover, customer feedback is not about online visibility. Collecting feedback from customers helps restaurants to roll out positive changes in the manner they work and consolidate their position in the market. Urge Customers to Leave Reviews: Frequently, customers do not leave feedback after dining at your restaurant. It is an extra task that they find beneficial doing only if they have something to complain about, or if the experience surpassed their desires. This is the reason most restaurants battle with negative reviews even when an extensive percentage of their customers are really happy with the dining experience, however, did not bother to leave reviews. 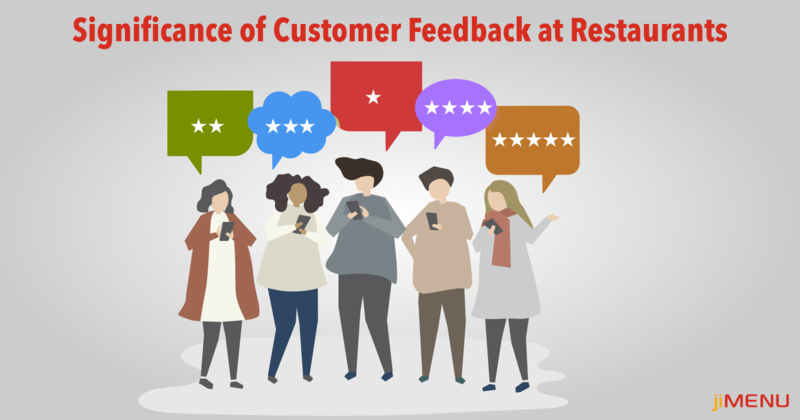 When customers fill up your customer feedback form after they dine, you can encourage them to leave reviews or you can seek their permission to post the review straight from the tablet feedback system. Nurtures Customers in the Long-Run: Feedback from customers is a magnificent method to anticipate which customers are likely going to come back to your restaurant. Nurture the customers who leave great reviews, and enlist them in a loyalty program. Offer rewards, gifts, and treat them like they are special, each time they have something positive to say in regards to your restaurant. Restaurant success thoroughly relies upon repeat customers, and getting customers to visit your restaurant regularly is possible just when you remunerate them for their loyalty. Improves Your Menu: Each restaurant customer review helps you to comprehend if your menu is fulfilling your visitors or not. When you ask detailed feedback from your customers regarding the menu, you will have the capacity to remove or add items depending on the situation. After all, the success of a restaurant relies upon its menu, and how well the menu is streamlined to upgrade customer experience. Makes Positive Changes: To stay away from future negative customer feedback, you can just request for feedback from customers soon after they dine using the tablet feedback system, and make changes to your ambiance and quality of food as soon as possible. Roll out those changes, for many other customers, may also like the changes you may make. Trains Staff to Treat Customers Better: Based on the restaurant customer review, you can prepare your staff to enhance their behavior toward customers. You could also prepare them how to request customer feedback with the goal that your patrons do not feel intruded directly after an overwhelming meal. Try to get your staff to act in the most non-intrusive way so that filling up restaurant feedback form feels like a natural task done after gorging on a sinful dessert. Integrate Feedback System in your Restaurant POS Now!!!!! As you can see, the advantages of customer feedback are not constrained to online reviews of supporting future customers. It encourages you to roll out positive changes to your menu, staff training, and concoct better marketing strategies. Customer insights assist you with improving your services and gain a competitive edge. If you do not as of now have a tablet feedback system, get it integrated into your restaurant POS to begin collecting feedback from customer like a pro.